Tony Higgins has quit as Scottish players' union senior officer, vowing to help bring dictator-style football owners to heel around the world. Higgins, 21 years with the SPFA, is to join Fifpro, which represents 57,000 players throughout the globe. "We have to make sure that club owners, when they move into a country, understand the culture of the players there," he told BBC Sport. "We've signed agreements with Uefa and Fifa and they have to listen to us." Higgins, who will become head of politics and education with Fifpro, was speaking the day after Hearts parted company with captain Steven Pressley after a disagreement with majority shareholder Vladimir Romanov. The union chief thought that the dispute was close to reaching the courts before the two sides came to a mutual agreement to release the Scotland defender from his contract. And Higgins pointed out that, in future, such matters would go to an independent tribunal at which Fifpro would represent the player. "What we are trying to do is keep lawyers out of football and do what we can within football to ensure justice for players and for clubs," said the former Hibernian and Partick Thistle striker. "While we need lawyers, if lawyers ran football, we would never get a ball kicked." "You see the effect of the Bosman decision, when a dispute has gone to court without the football authorities doining anything about it. "They would not listen to the players at the time. "Now, they can't change the transfer system unless Fifpro agrees to it." Higgins and the SPFA had been concerned by Hearts' treatment of Pressley and other players. "Obviously we cannot say too much about the legal content, but it's the type of example that, if this happened in the future, with the new recommendations and regulations coming from Uefa and Fifa, the players will know that it will go to an independent tribunal," he said. "Players will feel far stronger about bringing issues to the fore." Higgins will be part of a working party looking at club governance and licensing. "There is a worry that very, very rich individuals will acquire clubs then seek to acquire other clubs either through ownership or interest," he said. "Fifa is very worried and so is Fifpro as one person having an interest in many clubs can be unhealthy." West Ham controversially signed Argentina World Cup stars Carlos Tevez and Javier Mascherano in a deal with Media Sports Investments, who own the rights to the two players. 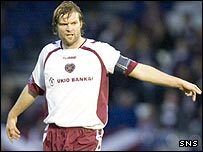 And Romanov's management style at Hearts has angered Scottish players but appears to have been accepted by their foreign imports. "A player in a certain country might accept that treatment, while other players, particularly in western Europe where there is a tradition of players' unions, might say I am moving on, I cannot take any more of this," added Higgins.